Title Card: The godfather was born Vito Andolini, in the town of Corleone in Sicily. In 1901 his father was murdered for an insult to the local Mafia chieftain. His older brother Paolo swore revenge and disappeared into the hills, leaving Vito, the only male heir, to stand with his mother at the funeral. He was nine years old. Woman: [subtitled from Italian] They've killed the boy! They've killed young Paolo! They've killed your son Paolo! The close-up shots of Michael's face as Rocco kisses his hand are deleted. The on-screen prologue is deleted. The shot of little Vito being marked with an encircled X among the benches filled with immigrants is deleted. The shot of little Vito singing by himself in Ellis Island is deleted. The scene of Anthony receiving his communion is deleted. Throughout the story of young Vito's rise, many of the lines originally spoken in Sicilian are dubbed in English. An alternate take of Vito walking down the aisle in the theatre. Scenes at the communion party are rearranged. The scene with Connie and Merle meeting with Michael appears earlier and the scenes with Senator Geary appear later. The scene where Vito brings a pear home and the scene where he first encounters Clemenza are switched to appear in the order originally intended. This explains why he is in a bad mood at dinner. An alternate take of Vito refusing the box of food from Signor Abbandando. A shot of Clemenza nodding to a customer in the café is deleted. The shot of Clemenza cutting the rug and playing with baby Sonny is deleted. Michael's reply of "New York City" at the Senate hearing is deleted. Q: Why does Vito wrap his gun with a towel when he goes after Don Fanucci? Q: Why does Frank Pentangeli agree to kill himself? 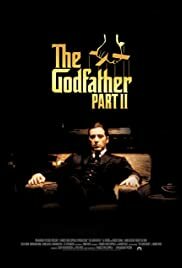 To me and probably to many other people The Godfather Part II is more of a continuation than sequel to The Godfather. Just look at the IMDb rating and you'll see I'm not the only one who feels this way. To me it as good as the first. The acting may have been better than the acting in the original. Robert De Niro gave a perfect subtle performance as Vito Corleone. His portrayal was powerful and breathtaking. When I think De Niro I definitely do not think subtle and smooth but that is exactly what he was in here. It is definitely one of his top three performances in his career. The depth in his portrayal was able to justify the Vito Corleone that Marlon Brando portrayed in the first. Al Pacino gave a very strong performance playing Michael Corleone. In here we get to see more of the tough decisions that have to be made and the consequences of certain actions. 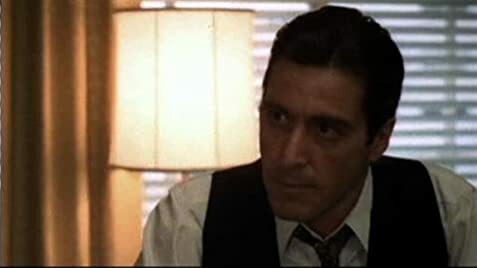 Al Pacino perfectly displayed the amount of thought and struggle that goes into and comes out of every action you make; the way it affects relationships, family, power and influence. Diane Keaton was not really given a lot of room to act in the first but in here she is very good. She did not play the stereotypical wife who always stands behind her husband but rather the woman with a mind of her own who is willing to go after what she feels she deserves. Robert Duvall again to me was the glue to the movie. Just having him in there kind of makes you feel safe. John Cazale also had more of an impact in here than in the first playing the half-witted brother always needing to be bailed out. A lot of these characters sound so familiar and stereotypical but in The Godfather Part II every character is played out with such extraordinary depth. Everyone from Talia Shire who gave a fine performance to Lee Strasberg all the way down to the kid who played young Vito Corleone were perfect. Part II seems to me to be more of a character study than the original. The directing once again is perfect. Francis Ford Coppola know or at least knew how to make a movie. The first to Godfather movie are done so precisely and perfectly that nothing really sticks out because they are so perfect throughout. Coppola just lets his actors play everything out as he should with type of cast he has here. Not to many movies can maintain such a consistent flow over 3 hours let alone even an hour and 45 minutes. The writing may not have been quite as good as the first in terms of quoting but the storyline was perfect. Seeing the decisions made by new mob boss Michael Corleone was common sense but flashing back on Vito Corleone's life was genius. The storyline to me could not have been better and Coppola and Puzo do a great job with it all the way. Like the first the cinematography was amazing but it had a slightly different tone to it. The first had more of a majestic, mythical look to it. In Part II you feel the modern times creeping in and the Corleones having to adjust to it. Part II has more of a corrupt and evil twist to it but I guess the end signifies that. The music obviously the same as the first was perfect and just fit so greatly with the rest of the movie. The first to movies of The Godfather series are really like the same movie. They are not the same though, they are actually very different but the greatness of them both and the continuation of the storyline from the first to the second really create a strong band between each other. To me it is only a sequel in that it was the second movie of a great series. No let downs, no disappointments just a continuation of of the greatness from the first one. 91 of 125 people found this review helpful. Was this review helpful to you?